Paul & Celia Houston, in white shirts, were second place winners. Lakewood youths Paul & Celia Houston earned the opportunity to compete for the coveted Bemis Trophy as the LYC Youth sailors traveled to Rush Creek Yacht Club June 3-4 to race in the Chocopalooza Regatta, which was the Bemis Area F Qualifier. 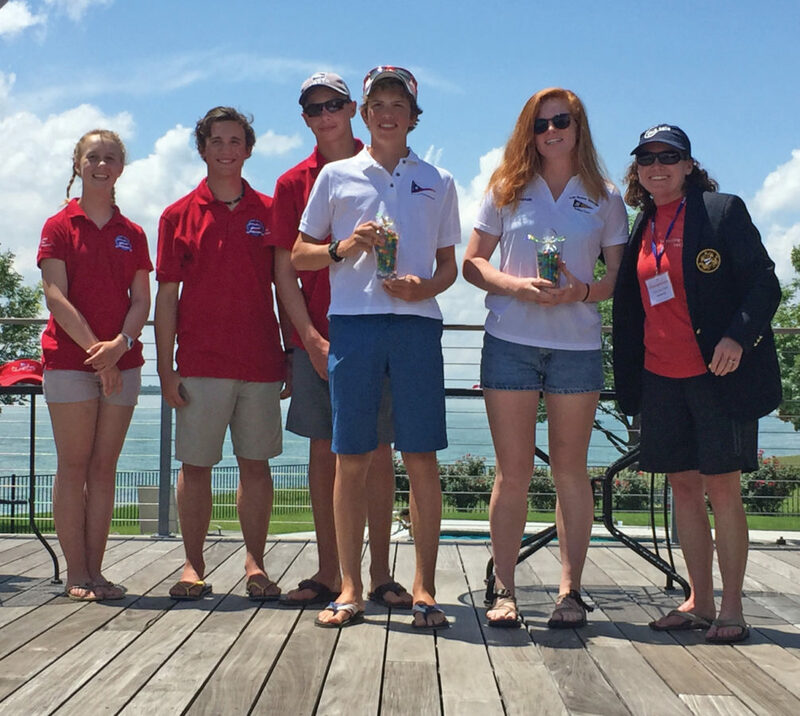 “After two days of very light winds in Dallas, Celia and Paul earned a second place at the Area F Qualifier for the Bemis Trophy,” said Lakewood Sailing Director Watt Duffy. This trophy is a U.S. Sailing National Championship for youth sailors in a double-handed boat. Sailors from all over the country pursue this trophy through regional qualifiers. This year non-LYC members Yumi Yoshiyasu and Kara Scully from Houston Yacht Club and Texas Corinthian Yacht Club finished first and LYC’s Celia and Paul Houston finished second. Both teams qualified to move on to the final round in New Jersey later this summer. Coach MacKenzie McGuckin coached five LYC teams at the eliminations and reported light oscillating winds that challenged the competitors consistency and resolve.